I have had a root through my pdf collection and found some articles that may be of use to you. This was taken from Mining Methods in Europe by Lucius W Mayer E.M. and was written after the author had toured Europe. The publication date was 1909 so this would probably date the information to around 1908. I scanned the pages at 300 dpi, and cropped them. It may be possible to reduce the image size and retain clarity. Hopefully the images will not take up too much space. A Text-Book of Coal-Mining written by Herbert W Hughes contains information on the use and care of pit ponies. I have checked your site with regard to pony content. The text that I have will prove a useful addition to the site. I have a few mining related advertisements from various books. These will be scanned and sent to you. 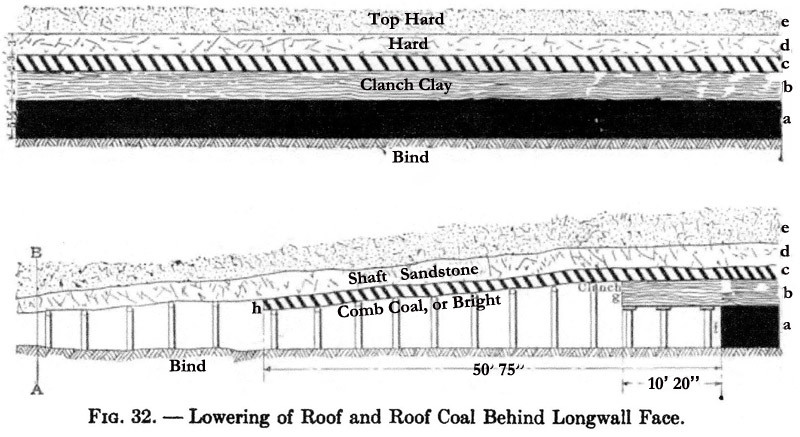 A 5 to 6-ft. Seam of Coal is Mined by the Longwall System. Two to four ft. above this Main Seam Lies a Thinner Seam of Useful Coal which in the Roadways is also Recovered. the Eastwood Colliery Company, in the Midland district, England, operates five collieries, one of which, known as the Watnall, lies near a town called Kimberly, reached by both the Great Northern Railroad and the Midland Railroad from Nottingham. The seam mined at Watnall carries from 5 to 5½ ft of steam coal, above which lies a 2- to 4-ft. strata of clayey material called clanch (Fig. 32). Above this is 2 to 3 ft. of softer coal called comb coal, or bright, which is useful for household purposes. The average cover above the coal horizon is 960 ft., consisting of comparatively hard shale; then follows limestone and red sandstone. Below the seam is a rock called "bind," and several thinner coal seams at various elevations which, though not worked to-day, will probably be minable in the future. There are three shafts on the property. The head-frame over two of them is shown in Fig. 33, the hoisting arrangement being similar to that at Seaton-Delaval. The shafts are 11 ft. in diameter, and are brick-lined throughout. Fig. 34 shows a landing at one of the shafts, with a double-deck cage loaded with four cars of 1400 Ib. capacity each. The men are drawing the cars off the cage by means of hooks, which they engage in eyes attached to the car body. Note the iron gate, 'a' which, running on a track, is raised when the cage ascends. There is but one compartment in the shaft, and on the down-trip in this shaft a load is being raised in balance up the other shaft, but a short distance away. In the mine a great part of the haulage is accomplished on self-acting inclines, graded 1 to 16. At the head of an incline was placed a friction controller brake, and hemp rope was used between the drum and the ribbon of the brake instead of wooden blocks of a particular texture, as ordinarily used for this purpose. Eighteen cars were operated in a trip. At the station at the bottom of the shaft the grade is laid steeper, and the empty cars approaching the shaft are held back by an interfering block until such time as the cage is at rest, when this block is depressed mechanically and the cars, with assistance, make for the cage and are readily placed thereon. 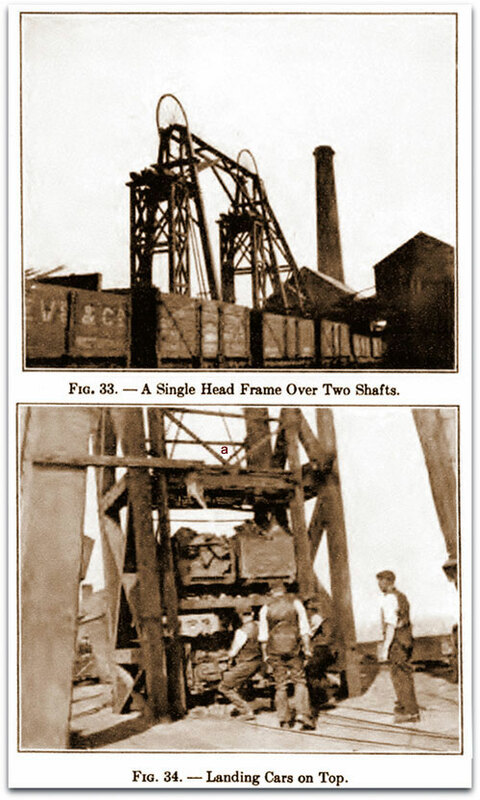 The method of mining employed at Watnall is longwall advancing. A pillar about 200 yards square has been left to support the shaft. The system involves running gateways about 120 ft. apart, and manipulating the longwall face between these gate roads, cross-gates being run at intervals according to requirements. Depending on the thickness of the clanch between the main coal and the comb coal, the seam is either undercut and the coal broken down, or, where the clanch is not too thick, this material is first cut-out and the coal broken afterwards (Fig. 35). On the tall posts in the figure rests the comb coal. Behind the face there is continual subsidence of roof on the packs. These packs are built with rock broken from the clanch, brought forward as the work progresses. Packs are built 12 ft. wide at 12-ft. intervals, so that 50 per cent, of the coal area is replaced. The clanch is brought down as close to the face as possible, when tall posts, are set to support the comb coal. The comb coal is won only in the gateways, the packs being set up to the clanch (Figs. 35 and 36). Behind the comb coal top-shales or sandstone makes its presence felt in the course of time. Supposing that the main coal is 5 ½ ft. thick, and clanch and comb each 3 ft. thick, there will be 11 ½ ft. of cutting altogether before the top shales are met, and if the gate stands any length ,of time it is probable that an additional 3 ft. of cutting will be necessary, due to the plunging up of the floor, and the further subsidence of the roof. The action of the floor and roof in removal of seams by longwall is interesting. Describing a floor as "soft" does not necessarily mean that it is a clay. Quite to the contrary, it may be a consistent sandstone not readily broken up. 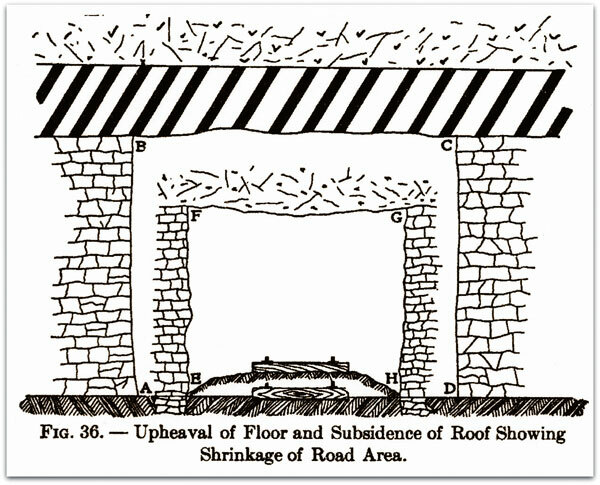 A result of roof pressure on the floor is shown in Fig. 36, showing the effect in the gateway after it had stood for a long period. A, B, C, D is the original form — E, F, G, H shows the form of the gate after the various pressures had exerted themselves. Behind the face are usually two rows of timber (Fig. 35), one close to the coal — which at times is omitted — and another 5 to 6 ft. back; cars run between the two. This road communicates with the cross-gateways and finally the main haulage-way, which communicates with the shaft over a mile away. The timbers at the face are practically all withdrawn. The blocks of ground are let to a contractor who is responsible for the stalls he is working. Should he fail to recover timber where the roof is known to be good, his monthly settlement is likely to show reduction. The average wage in the camp is 7 to 8 shillings per shift of 8 hours. Contractors get 2 s. 8 p. per ton of coal won, inclusive of timbering and pack-wall building. They are paid extra for ripping, and the company removes the coal from the face.